As America celebrates another birthday and the British people celebrated their Brexit vote for freedom from tyranny to a supranational bureaucracy, the heart and soul of the American Left again exposed itself as statist and globalist. Exhibit A: Steve Pincus. His recent Washington Post article attempts to paint Brexit supporters and the Republican Party as racist, anti-American xenophobes. In his introductory and subsequent paragraphs, Pincus inextricably links pro-Brexit forces with the agenda and sentiments of American conservatives and Pincus finds them wanting. His headline asserts, “No, Brexit was not Britain’s ‘Declaration of Independence.’ It was the exact opposite.” Pincus couldn’t be more wrong. His subheading: “The American founders would revile the pro-‘leave’ camp.” Again, his conclusion is contrary to everything we know about the Founding Fathers. Pincus makes two striking, and strikingly wrong, claims. Actually, American colonists sought control over their own borders. They vehemently opposed a power across the Atlantic Ocean determining their fate and enacting laws without their consent and contrary to their wishes. The very first Congress actually limited and circumscribed immigration by a clear set of criteria, looking for emigres from the Northwestern European nations which had settled America. In contrast to the Founders’ wishes and the law of the land, today illegal aliens celebrate their Mexican holidays while burning the American flag and promoting the overthrow of the American government. Our Founders would have put a stop to this. But what did the crafters of our Republic actually mean by “welfare?” The Founders sought to promote the “general welfare and happiness of the people” by securing liberty! They understood that a free people – being secured in their liberty and able to use their God-given gifts as they deemed best – could, in today’s parlance, “maximize their potential,” strengthen their local communities, and improve the general welfare of the nation. Our Founding Fathers fought for freedom and limited government to preserve that freedom. Pincus clearly regards FDR’s “Second Bill of Rights” as superior to, and countermanding, our Founders’ original Bill of Rights. FDR’s progressive economic bill of rights seeks equality of outcome through government force while the Framers of our Constitution, with their political bill of rights, sought to maximize freedom and, thus, equality of opportunity. Progressives like Pincus agree with President Obama’s assessment that America is fundamentally flawed and, therefore, needs to be fundamentally transformed. The Founders, Framers, and generations of Americans heartily disagree. Middle America seeks to reclaim its heritage, one built upon a Judeo-Christian ethos which cherished liberty. Similarly, progressives like Pincus, the Obamas, and the Clintons seek to eviscerate nationalism and elevate supranational and global institutions. In doing so, they willfully dismiss, like willing dupes, the nexus between the immigration and terrorism crises. Progressives follow Hillary Clinton’s It Takes a Village (i.e., big government) when our great nation was founded on the premise that the primary duty of government is the protection of the People at home (law enforcement) and abroad (national defense) – and from government itself (Constitution). At heart, America as a Nation and a People matters little to these progressives who prefer to use American power and ideals against her in pursuit of their own globalist utopian goals. Pincus equates “English First” pro-Brexit voters with the resurgence of contemporary America Firsters inspired by Donald Trump. To some degree he is correct, yet he regards that as a bad thing. 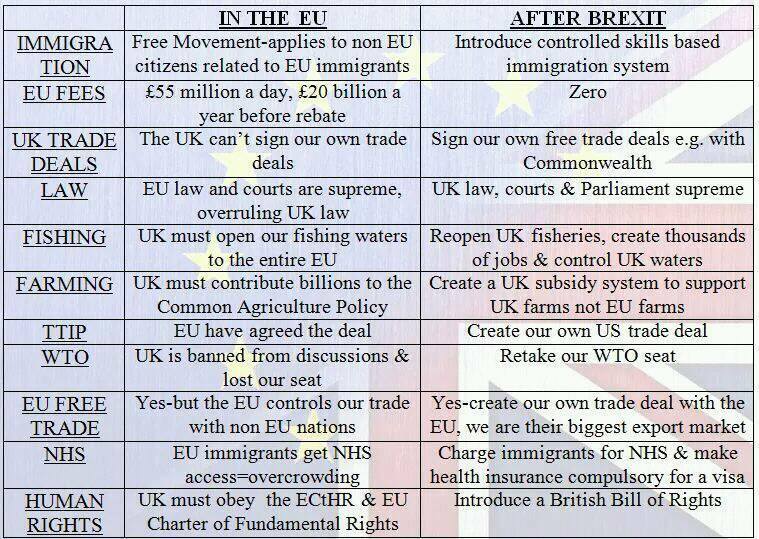 The heart and core of the Brexit Vote was to liberate the British people from the bureaucratic behemoth of the European Union’s usurpation of national sovereignty and abrogation of the will of the People. Similarly, Middle America seeks its own independence from a draconian federal government which serves its own needs and purposes while thwarting those whom they purportedly serve. But Pincus again twists the historical record, asserting that late 18th-century Britons wanted the American colonists (legal settlers all) to pay their “fair share,” likening them to illegal aliens in America, today. In reality, the American colonists – who were all self-supporting and obviously did not rely on a non-existent welfare state for survival – disagreed with the Mother Country and insisted upon, “No taxation without representation.” Our forefathers, like us, preferred a free market system without undue taxation and regulation, the very things Pincus and his lot pursue. In his tract (and presumably in his forthcoming book as well), Pincus skirts this crucial reality: the majority of the colonists came from Britain and shared legal, linguistic, political, social, cultural, and spiritual similarities with the British realm. Those brave men and women who gave birth to this great nation were brothers and sisters by blood who forged a new nation by creed. That creed – “all men are created equal” and “endowed by their Creator with certain inalienable rights” – is central to our identity as Americans. Individual rights, not collective rights; equality of opportunity, not of outcome; reverence for God, not for the State. As Americans, we should celebrate the greatness of America as achieved by the Providence of God through the wisdom of the Founders and we should strive to return to our roots, to restore that vision of “government of the People, by the People, and for the People,” eschewing the liberty-denying statism of the Progressive vision. Let us reinvigorate the American experiment that it may not perish from the earth. Pincus’ historical revisionism is apparent in the title to his forthcoming book, Heart of the Declaration: The Founders’ Case for an Activist Government. See “Flags Depict Obama’s Fundamental Transformation of America and the World” at http://t.co/xjupplSWD1. See “Reclaiming America!” at http://wp.me/p4scHf-9V. See “CPAC: America’s Christian Heritage Denied” at http://wp.me/p4scHf-8E. See “Willful Blindness to Reality” at http://wp.me/p4scHf-c9. See “Member of European Parliament Links Terrorism with Immigration Crisis” at http://wp.me/p4scHf-e8. 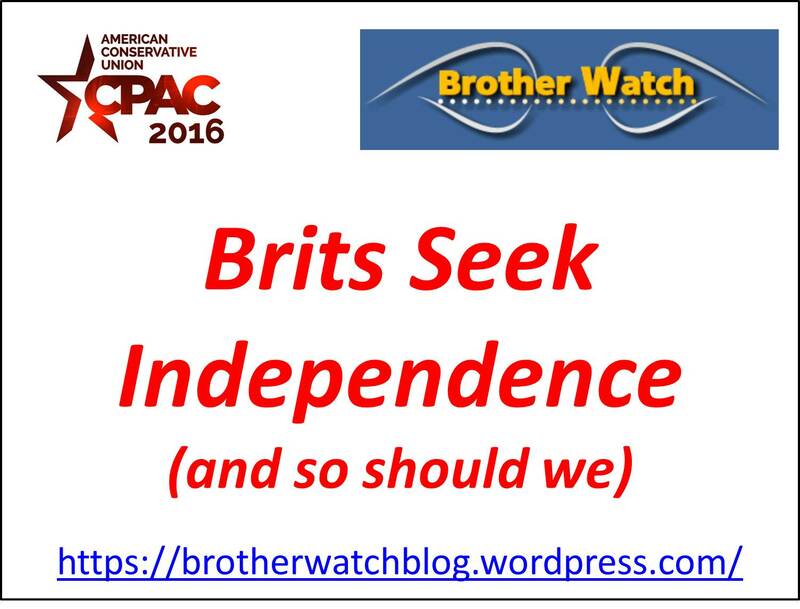 See “CPAC: Brits Seek Independence (and so should we)” at http://wp.me/p4scHf-eT. 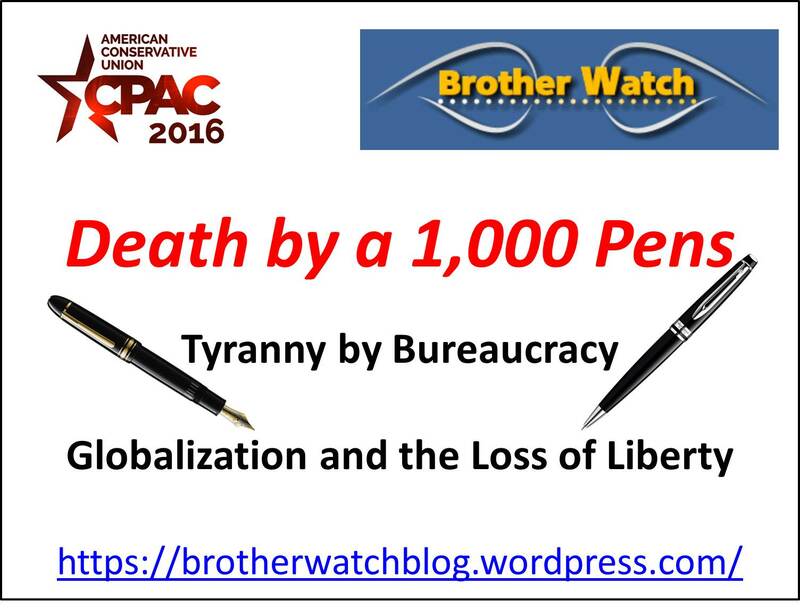 See “CPAC: Death by a 1,000 Pens” at http://wp.me/p4scHf-eV. This entry was posted in Uncategorized and tagged activist government, America First, American Experiment, American Revolution, anti-American, Bill of Rights, Brexit, bureaucratic state, collective rights, Economic Bill of Rights, English First, equal opportunity, equality of outcome, European Union, Founding Fathers, Fourth of July, Framers of the Constitution, freedom, general welfare, globalism, God Bless America, GOP, Heart of the Declaration, illegal aliens, immigration, Independence Day, individual rights, It Takes a Village, Leftism, liberty, limited government, national sovereignty, nationalism, open borders, original intent, patriotism, progressivism, propaganda, Providence, racism, Second Bill of Rights, statist, Steve Pincus, supranational, Thomas Jefferson, xenophobia on July 4, 2016 by BrotherWatch. We have seen why so many Brits seek to flee the European Union, whose centralized, supranational government prevents Britain from protecting itself from the immigration crisis and terrorist threat contained therein. Terrorism is not the only threat posed by edicts from the European Union. Freedom itself is at stake! Steven Woolfe, a Member of the European Parliament, offered his insight into the dangers of a centralized government within a supranational context. Those insights are extremely relevant to the ongoing battle for power within the United States between the various branches of government as well as the struggle over federalism vs. statism. Hint: Liberty is losing. According to Woolfe, the European Union has become a “super state in which control over the power of the laws is held in Brussels by unelected civil servants.” The bureaucratic state – unelected and unaccountable to the People – enjoys an ever-increasing degree of control over the lives of the citizens of the European Union. Who runs this proto-colonialist empire? Bureaucrats! Woolfe argues that the European Union is in embryonic form what globalists have always wanted to achieve. Woolfe almost sounds like a Bernie Sanders because he discerns a collusion between corporate Europe and the bureaucrats who make the laws. In the 1870s, German Chancellor Otto von Bismarck created the modern welfare state, with its byzantine bureaucracies and labyrinth of administrative laws. Bismarck’s model became the blueprint for Western European nations and also for progressives in the United States of America. At the heart of his model is centralized planning by elites made up of the self-anointed “best and brightest” who think that they know better than we do how to live our lives. John Daniel Davidson has observed that “The father of American progressivism, Woodrow Wilson, saw this coming.” Wilson “thought the U.S. Constitution was outdated and that America needed a professional, Prussian-style administrative state, and that the chief hindrance to this in America was popular sovereignty.” Wilson believed that “expert administrators” were superior to the will of the People. Either the rule of law by representative government or law by executive and administrative fiat will prevail. They cannot coexist. Peaceful coexistence is a myth. What President Obama couldn’t get passed in Congress he has sought to enact through the power of his pen and his phone. He has bypassed Congress through unconstitutional executive actions on immigration and other matters. Further, he has politicized the IRS, EPA, HHS, Justice Department, Homeland Security, and other federal agencies to target his political foes and implement his contra-Congress agenda (the will of the People be damned!). Obamacare exemplifies and is representative of all that is wrong with administrative law. Case in point: The whole power of the federal government is intractably opposed to and wielded against charitable work performed by the Little Sisters of the Poor. Ronald Reagan’s famous 1964 speech, A Time for Choosing, should be revisited by all lovers of liberty. The 2016 election is of paramount importance and freedom itself hangs in the balance. Indeed, this election is about survival. Will we elect a fraud and a mountebank, Donald Trump, or an official Democrat candidate (Hillary Clinton or Bernie Sanders) – statists all? Or will we choose the only constitutional conservative in the race, Ted Cruz? Update: Wesley J. Smith writes: “The political left loves the Bureaucratic State because it allows unelected and democratically unaccountable “experts” to be in control–for our own good, of course.” Smith exposes how the Equal Employment Opportunity Commission (EEOC) is invading your privacy and intruding into your health care! Vaclav Klaus, “The Crisis of the European Union: Causes and Significance,” Imprimis, Hillsdale College, July/August 2011, http://imprimis.hillsdale.edu/the-crisis-of-the-european-union-causes-and-significance/. Philip Hamburger, “The History and Danger of Administrative Law,” Imprimis, Hillsdale College, September 2014, http://imprimis.hillsdale.edu/the-history-and-danger-of-administrative-law/. Larry P. Arnn, “A Return to the Constitution,” Imprimis, Hillsdale College, November 2007, http://imprimis.hillsdale.edu/a-return-to-the-constitution/. See “CPAC: This Election is About Survival” at http://wp.me/p4scHf-dO. See “Coulter Admits Trump is a Fraud” at http://wp.me/p4jHFp-cf. See “HRC: A Caricature of the Left” at http://wp.me/p4scHf-94. See “CPAC: Ted Cruz in Control” at http://wp.me/p4scHf-8b. See “BrotherWatch Endorses Ted Cruz” at http://wp.me/p4scHf-dw. See “Cruz and Fiorina Are Dream Ticket” at http://wp.me/p4scHf-eQ. This entry was posted in Uncategorized and tagged A Time For Choosing, administrative law, administrative state, Bernie Sanders, Brexit, Brigitte Gabriel, Brussels, bureaucracy, Carly Fiorina, centralized government, civil servants, CPAC2016, David Cameron, David French, Dennis Prager, Donald Trump, European Parliament, European Union, executive fiat, federalism, Hillary Clinton, immigration, ISIS, Jonah Goldberg, Larry Arnn, lemonade stands, Little Sisters of the Poor, managed migration, migration, national security, national sovereignty, nationalism, Never Trump, one-world government, open borders, Phillip Hamburger, Prussia, refugees, Ronald Reagan, statism, Steven Woolfe, supra-nationalism, supreme court, Ted Cruz, terrorism, transnationalism, Vaclav Klaus on May 3, 2016 by BrotherWatch. Many Brits seek independence from the European Union. Barack Obama and other statists oppose that effort. Why? 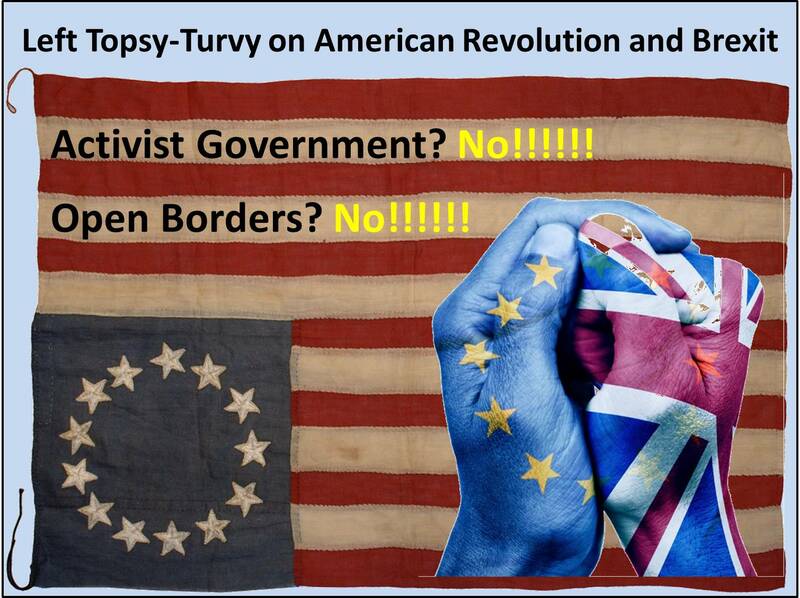 Because they favors transnational, big government at the expense of national sovereignty and individual liberty. Steven Woolfe, a Member of the European Parliament, is leading the charge for British independence and freedom lovers everywhere should support him. John O’Sullivan observed that the issue of national sovereignty favors Brexit supporters since the U.K. only has “one-28th of the EU’s decision-making authority, and thus power.” Therefore, it is in the best interests of those who want more freedom and more say in how to live their own lives to pursue freedom from the European Union. Moreover, per O’Sullivan, “former chancellor, Nigel Lawson, pointed out that on all the 72 occasions when an issue was voted on in the EU Council of Ministers, Britain had been outvoted every time.” In other words, national sovereignty has been subordinated to supranational authority. Naturally, those who favor statism and the advancement of a big government agenda oppose Britain’s efforts to leave the E.U., while those who favor freedom, limited government, and national sovereignty support Britain’s desire for independence. Donald Trump equivocated, saying that the Brits “may leave” the European Union but refused to say whether that would be good or bad. Update: Congratulations to our cousins across the pond for their stunning victory for Liberty. Will Brexit mark the beginning of the demise of the European Union just as the Soviet Union, one by one, lost its satellite states? Brexit is a victory for freedom and a blow to progressive statism and supra-nationalism. This entry was posted in Uncategorized and tagged Barack Obama, Bernie Sanders, Brexit, Brussels, bureaucracy, civil servants, CPAC2016, David Cameron, Donald Trump, European Parliament, European Union, Hillary Clinton, immigration, ISIS, managed migration, migration, national security, national sovereignty, nationalism, Never Trump, one-world government, open borders, refugees, statism, Steven Woolfe, supra-nationalism, Ted Cruz, terrorism, transnational, transnationalism, UK-US trade agreement on May 2, 2016 by BrotherWatch. Terrorism strikes Brussels, puzzling the Left while validating the Right. 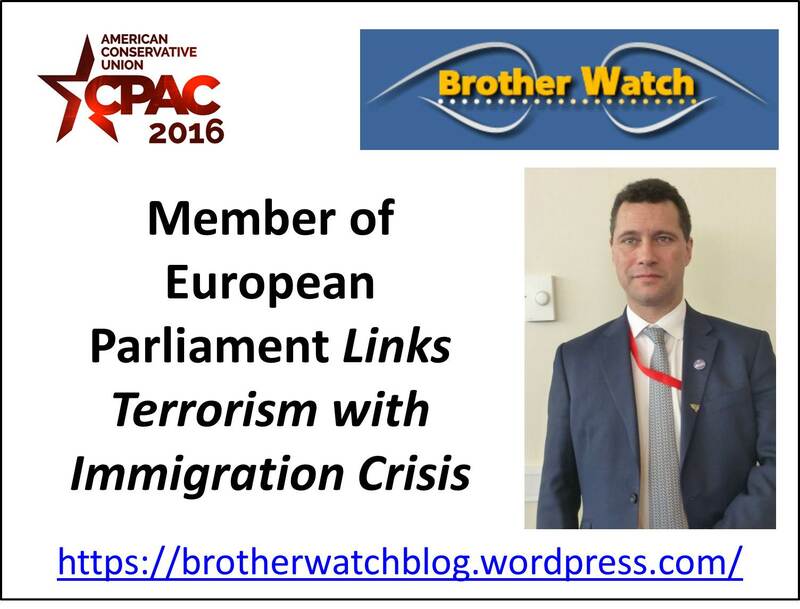 Steven Woolfe, a Member of the European Parliament, linked the escalating terrorism seen in Europe with the immigration crisis which has deluged so many European nations. According to Woolfe, Europe desperately needs to end its “open-door [immigration] system that Angela Merkel from Germany permitted,” a system which has swamped Europe with millions of unassimilated people who drain the welfare state and potentially endanger the citizenry. Woolfe would replace that “open-door” with “a managed migration system.” He acknowledges that “some immigration is useful for a country,” but argues that each nation in Europe should have the right to control its own borders based upon its own priorities. While welcoming refugees from migration camps is one thing, European citizens are coming to see that unrestricted migration poses a clear and present danger to European citizens. Therefore, Woolfe proposes dramatically limiting the influx of refugees and other migrants, declaring that Europeans “must turn back the boats – back to Libya, back to Lebanon, back to Turkey – to ensure that this crisis stops. This entry was posted in Uncategorized and tagged Angela Merkel, Boca Haram, Brexit, Brussels, CPAC2016, European Parliament, European Union, gangsters, immigration, ISIS, Islamist, jihadist, managed migration, migration, open borders, refugees, Steven Woolfe, terrorism, traffickers on March 23, 2016 by BrotherWatch. Since then, things have gotten far, far worse. 9/11 changed the world as we knew it and the Obama presidency has fundamentally transformed America. 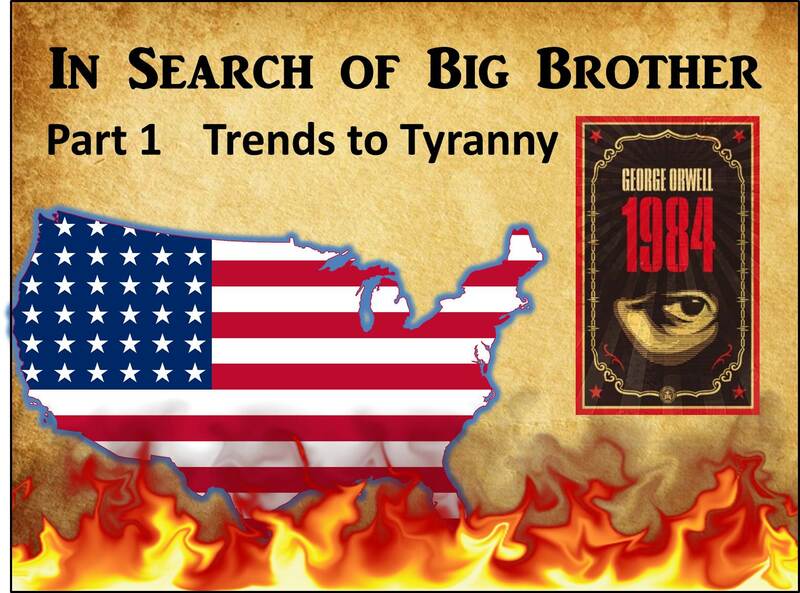 Orwellian trends which began more than 50 years ago have reached critical mass and We, the People, seem helpless to stop it. We are at a pivotal point in history where civilization itself seems in jeopardy and what each one of us does (or does not do) will determine the outcome. I addressed four cultural and political trends, each of which has been magnified with 1) the advent of astonishing technological advances which have revolutionized life around the globe, 2) the reemergence of belligerent tyrannical and terrorist regimes in hot spots around the globe, and 3) the unbridled assault of political correctness advancing a socialist agenda in America. Those four trends are balkanization, globalization, technophilia (progress) and technophobia (regress or primitivism). These trends have been visible for more than half-a-century and they are accelerating at a tremendous pace. Singly, they pose perplexing problems, but combined, they may prove themselves beyond our ability to deal with. Back in the mid-1990s, Samuel Huntington envisioned a clash between Eight Civilizations; Joel Garreau dissected North America into Nine “Nations.” U.S. News & World Report described Seven Tribes in the United States and also pictured the Two Nations of America. Matthew Connelly and Paul Kennedy prophetically predicted an invasion of the West by the Rest, while Peter Brimelow documented that invasion in Alien Nation. Clearly peace on earth has not become reality. The world is falling apart, nations are disintegrating, cultures are fragmenting, peoples are torn asunder, and many question whether Humpty Dumpty can ever get a face lift let alone be repaired. The centrifugal forces in society are creating sub-groups within sub-groups, cults within cults, enclaves within enclaves, in a relentless process of fragmentation – all culminating in a drive for a strong hand (e.g., strong centralized government) to bring it all back together again. Over the past three decades, American identity, American values, and American purpose have all undergone enormous transformation. The nature and value of citizenship itself is in peril. Who we are as a People is under attack by usurpers who would redefine our very being. The forces arrayed against Americans are unyielding. We, like Winston Churchill, must never surrender! President Obama contends that America is fundamentally flawed and that, under his leadership, she has never been stronger. His evidence refutes his contention. Fortunately, most Americans still cherish American exceptionalism and reject the values foisted upon our nation and her people. Now, as we are encircled by a multitude of genuine crises (and distracted by a host of hysterical hoaxes), we must combat the agenda of Obama and the far Left and renew the vision and pursue the dream bequeathed to us by the Founders. Let us reclaim the America that became great because she was good. Our vision must be clear and our purpose focused. We must not be distracted or confused by Orwellian rhetoric from the Left. To that end this essay series is dedicated. Please join me in this journey of introspection as this series of essays explores the depths of the dangers facing us in the world, in our nation, and in our local communities. Let us, together, discern what went wrong, identify the enemy forces confronting us, and take action to restore the American Dream. See “Obama: America is Stronger Than Ever” at http://t.co/3dxkSeF8fj. See “America – Lost in a Fog of Immorality and Tyranny” at http://wp.me/p4scHf-aL. See “’Hope & Change,’ and Other Orwellian Clichés” at http://t.co/v6fgItffhm. This entry was posted in Uncategorized and tagged 1984, Alien Nation, American Dream, American exceptionalism, anarchy, balkanization, Barack Obama, Big Brother, big government, Christian nation, climate change, Constitution, countercultural revolution, Founders, Founding Fathers, Framers, freedom, fundamentally transform America, George Orwell, global warming, globalism, globalization, identity, illegal immigration, immigration, Islamic jihad, Joel Garreau, justice, liberty, open borders, Peter Brimelow, progressivism, renewal, restoration, Samuel Huntington, sanctuary cities, socialism, technophilia, technophobia, terrorism, tyranny on October 23, 2015 by BrotherWatch.